SAP Business One is an Enterprise Resource Planning solution and business management software that offers CRM tools to convert prospects into customers, grow your customer base, and enhance customer loyalty through customer satisfaction. SAP Business One CRM capability allows businesses to efficiently handle customer relationship. The CRM functionality enables you to manage customer contacts from an integrated location, track sales opportunities, and gain visibility in the sales pipeline. It also provides sales support to build stronger and lasting customer relationship. Running campaigns with SAP Business One is easy-to-use. It allows you to import contact lists from MS Excel, run email and other marketing campaigns. Segment your contacts into targets groups based on industry, geography, type of product purchased. Actively turn a qualified lead from the campaign into sales opportunity and follow up with them through sales quotation. Analyze campaign performance through integrated reports to help you determine factors like response rate and overall success of the campaign. SAP Business One UAE can easily integrate with MS Outlook to help you synchronize contacts and manage day-to-day customer interactions like setting reminders for calls, meetings and tasks. It allows you to manage sales process, predict sales potential and analyze sales outcomes. With SAP Business One, you can create instant price quotations, order confirmations and billings through a variety of templates and send them to your prospects and customers in standard PDF or other commonly used formats. SAP HANA powered version of SAP Business One provides flexibility to reschedule orders dynamically to enable you to deliver goods on time and maintain high level of customer satisfaction. Customer master record feature allows you to manage lead and customer data with the help of a simple user interface.Manage important customer payment-related data like customer balances, credit lines, special discounts, bank and credit card information. SAP Business One Dubai is designed to simplify management of customer warranties, service calls, and service contracts. Service agents and executives can swiftly manage service calls and monitor service levels with alerts and reports. SAP Business One further allows customer service agents to track customer problems and search for solutions through a knowledge database for furnishing a prompt response. 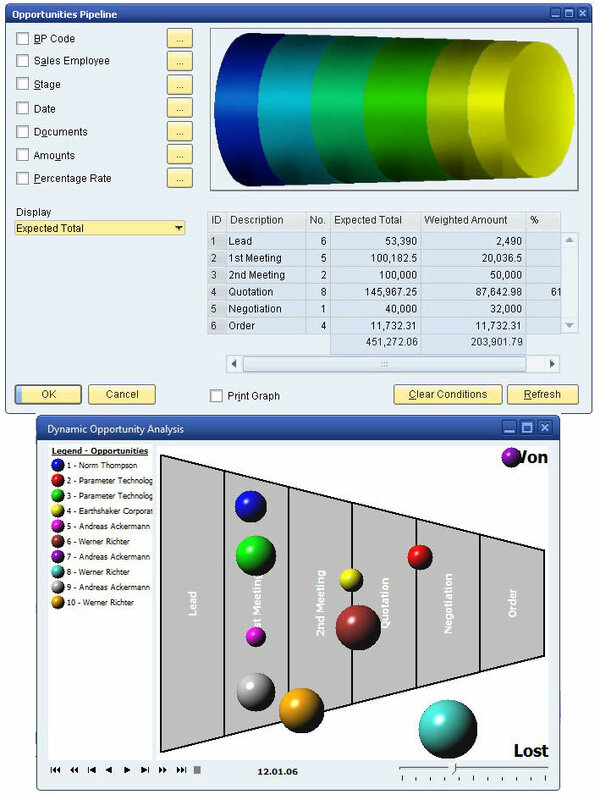 Create powerful sales reports with SAP Crystal Reports and stay updated about sales opportunities, conduct sales forecast, and assess sales and service performance.Create dashboards to view information at a single location and monitor sales across customer and sales stages. With the support of SAP HANA platform, employees are empowered to create and run ad hoc reports on SAP Business One without IT assistance. SAP Business One CRM helps you to achieve high sales revenue by managing your activities and opportunities across the sales cycle. It enables you to optimize customer relationship processes so that you get a complete view of your customers thereby helping you to understand them better. Customer data is accessible anytime and anywhere through SAP Business One mobile app thereby increasing employee productivity. SAP Business One delivers an outstanding performance for managing customer relationships. It allows you to setup and run marketing campaigns and also analyze performance of the campaign. 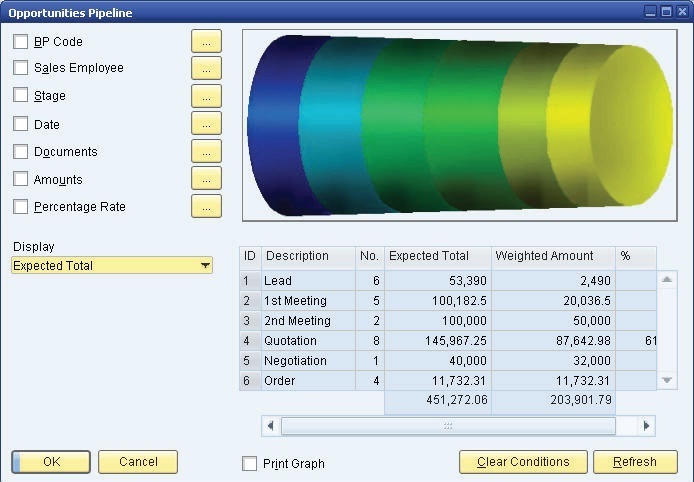 It enables you to manage and analyze sales process and tap new opportunities through revenue projection. SAP Business One can efficiently manage service warranties, service contracts and service calls. Customer service reps can tap into knowledge database to look for commonly reported problems and quickly provide solutions. Lastly, integration with MS Outlook, MS Excel and its ability to generate ad hoc reports certainly make SAP Business One an advanced business solution. 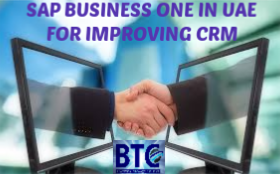 Contact us to get complete control over your business and optimize customer relationship with SAP B1 in UAE solution offered by BTC Dubai.